>I don’t know how many days I have been traveling, but arriving felt great. We got to our hotel around 3 in the morning and were up at 7 ready for breakfast. Fried rice, an egg, some shrimp chips a toast started us for a long day of adventures. My Dad has known Wayan, our guide, for over 20 years. 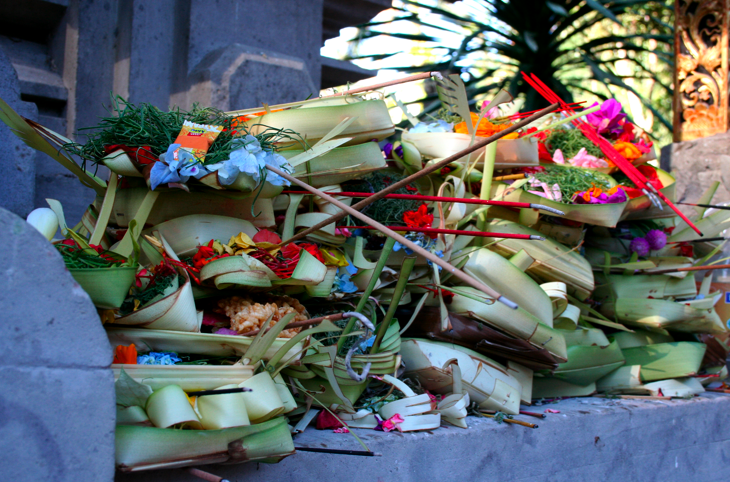 Before Wayan met us we wandered through the town of Ubud. The town was still asleep at 9am and we quickly realized that it was more known for it’s nightlife than the arts and crafts we had heard about. Once these cool villages become discovered and highlighted in a travel book, they all seem to instantly crank out pizza places that play Bob Marley and offer drink specials and “ladies night”. We called Wayan immediately and asked him to get us out of there. Along the way we say many arts and crafts shops that were not in fact in Ubud. They sold all kinds of things! We stopped for lunch at one of the highest spots on the island. 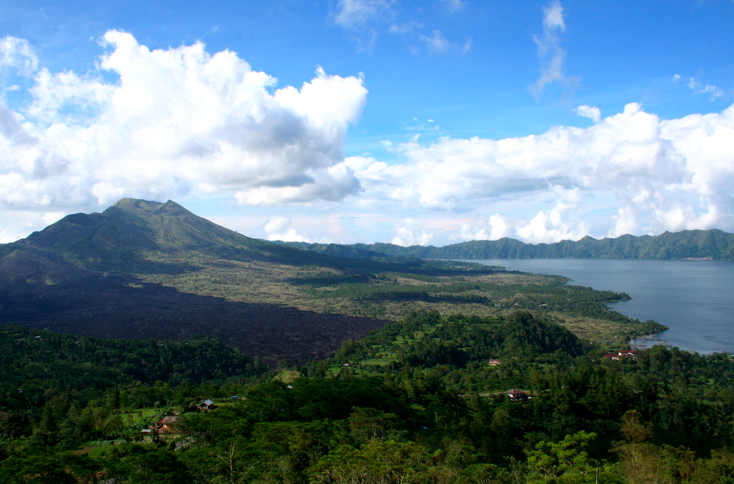 We ate at the super touristy Lakeview Restaurant overlooking Lake Batur. Down below there are traps that Wayan told me hold “carp like” fish. People prefer to fish in the ocean because the fish taste better. But you could find a wife here in the country to take back to America if you were so inclined. 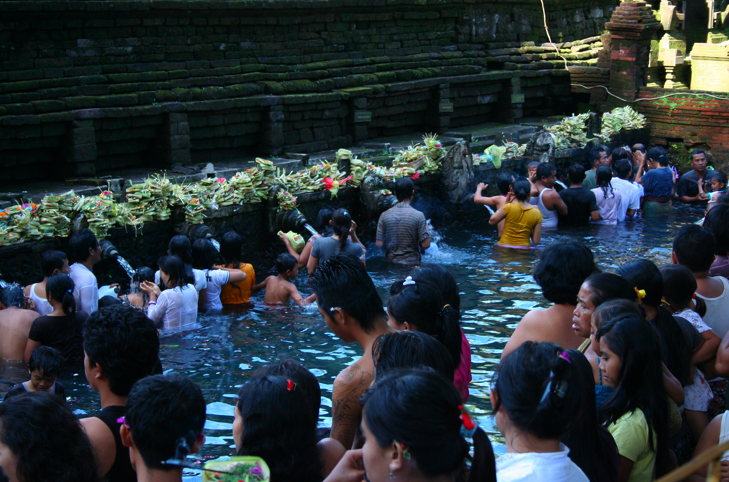 Declining the option for a local wife, we next headed to Pura Tirta Empul or the Temple of Holy Water. The god Indra’s forces had been wounded in battle, so he pierced the earth creating this spring to revive them. Now all of these people bathe here and take some of the water home in jugs. We were here during the full moon which is a reason for the whole village to arrive and pray. Offerings are made to the gods. Incense, flowers, food, lots of things are in the offering baskets. Offerings are brought in on large baskets. The rice is blessed and handed out. People press the rice and holy water to their face. The more rice, the more blessed? 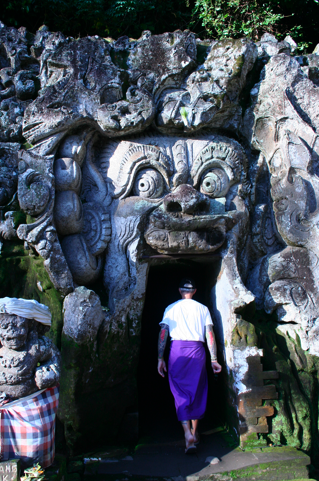 For our last adventure, we headed to Goa Gajah, or the Elephant Cave. There are demons carved on the outside and a Ganesh on the inside. There are marks where the cave was expanded by hand. All impressive as it was built in the 9th century. Dad hopes the demons are still working! 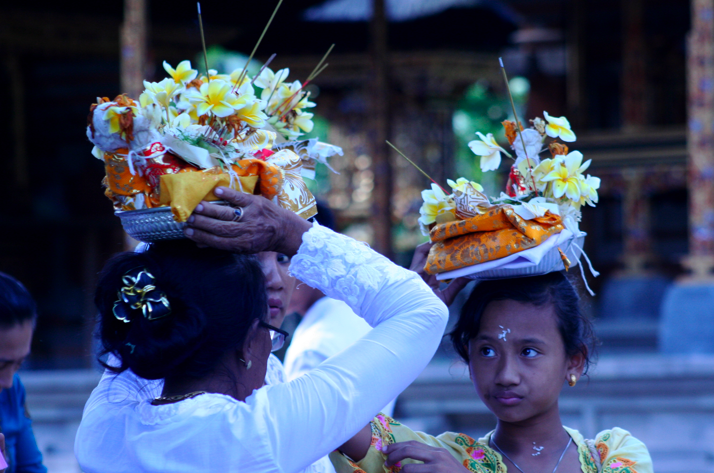 This entry was posted in Bali, travel, vacation by Rory. Bookmark the permalink. >Eh, try set the white balance appropriately on your camera…Everything looks a bit blue. Just turn the dial to the "Cloudy" or "Shade" setting and everything will look a lot warmer and better(should still do this under sun too).Cool bottle openers!